Melaleuca alternifolia (Maiden & Betche) Cheel, J. Proc. Roy. Soc. New S. Wales 58: 195. 1924 publ. 1925. Melaleuca linariifolia var. alternifolia Maiden & Betche, Proc. Linn. Soc. New South Wales 29: 742. 1905. Govaerts, R. et al. 2017. Melaleuca alternifolia in World Checklist of Selected Plant Families. The Board of Trustees of the Royal Botanic Gardens, Kew. Published on the internet. Accessed: 2017 8 14. 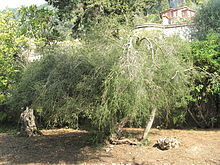 For more multimedia, look at Melaleuca alternifolia on Wikimedia Commons.